You might have googled for the free IDE editor If you are a programmer. You get many IDE (integrated development environment) editors in the result but most of them are paid. 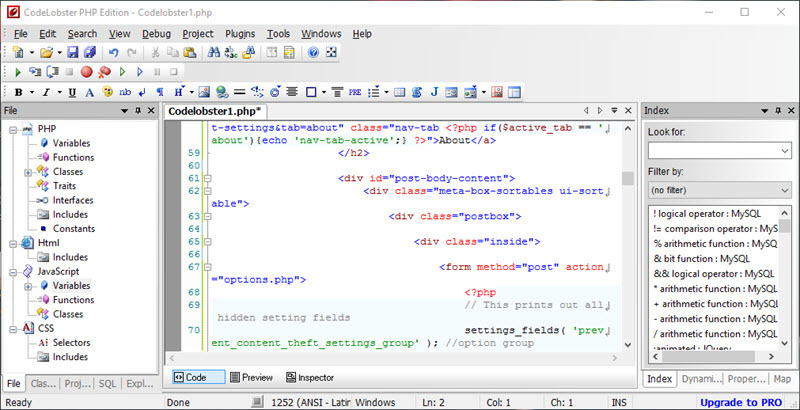 In this article, we are going to introduce a free PHP IDE editor for web application development. Are you a professional PHP developer? Or do you work with content management systems like WordPress, Drupal, Joomla or Magento? Then Codelobster is a perfect IDE editor for you. Let’s check out all the features of Codelobster PHP Edition in detail. You need not go through the entire CSS file to change the HTML element style, Codelobster’s HTML and CSS code inspector shows you the element style on just placing the mouse on it. Got messed with the PHP code? PHP debugger helps to debug your PHP code by executing the scripts incrementally and go through each and every line of code. Want more details on the syntax you are writing? Pressing the F1 key opens the detailed information of selected tag for all the supported languages. Want more features? You can opt for the PRO version which supports FTP/SFTP, version control system, SQL manager, code validator, code snippets, code formatting, SASS and LESS and support for many PHP frameworks like Codeigniter, CakePHP, Laravel and Symphony etc. Codelobster PHP Edition PRO provides auto-complete as well as context and dynamic help for theme development and plugin development in CMS like WordPress, Drupal and Magento. It also comes with a theme editor to quickly create the themes for content management systems. Download your free copy of Codelobster here. Well I’ve been using notepad ++ since a long time for editing purpose. I think this IDE editor is also cool and useful.